Why do blacks and Hispanics suffering from “HIV disease” live longer than Asians, Native Americans, or whites suffering from “HIV disease”? 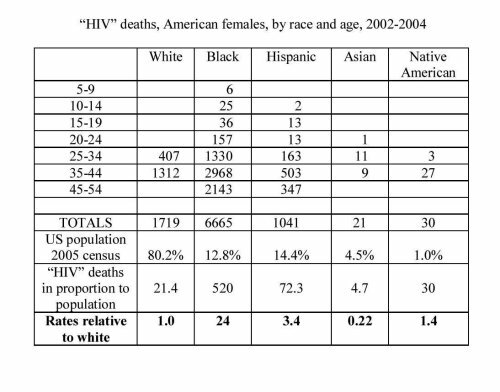 — Among American women, between 2002 and 2004, all deaths from “HIV disease” among Asians, Native Americans, and whites occurred before age 45; but one third of black and Hispanic women with “HIV disease” lived past 45. 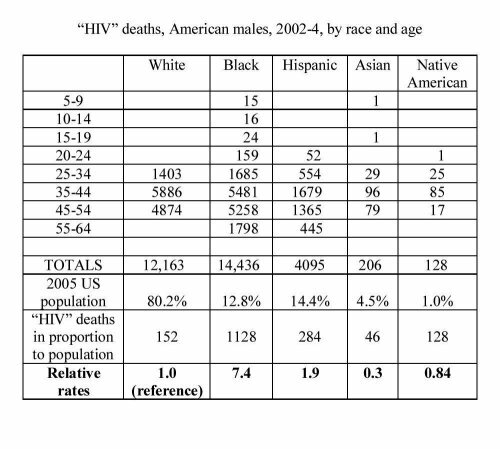 — Among American men, between 2002 and 2004, all deaths from “HIV disease” among Asians, Native Americans, and whites occurred before age 55; but more than 10% of black and Hispanic men with “HIV disease” lived past 55. It’s generally believed that black and Hispanic Americans do not enjoy as high a level of medical care as do white Americans. So why do they stave off this disease better? Could it be because they are not being treated with “life-saving” or “life-prolonging” antiretroviral drugs? A good theory can make predictions that turn out to be accurate, and it can explain new results as they come in. HIV/AIDS theory fails on both counts. — The first prediction was made already as the theory was being announced in 1984: a vaccine against the virus would likely be available within two or three years. Not only is there no vaccine: scores of attempts have all failed, and we have yet to discover what physiological properties of a vaccine would protect against “HIV infection”. — A second prediction was that AIDS would spread into the general population since its cause was a sexually transmitted agent. There has been no spread into the general population. There has been no breaking out geographically either—Sub-Saharan Africa remains the only region with an HIV-positive rate ≥5%; the Caribbean remains the only other region with an HIV-positive rate ≥1%. — New results, far from being explained by HIV/AIDS theory, have brought conundrum after conundrum: the epidemiology of “HIV” is unlike that of any other sexually transmitted agent, indeed of any infectious agent (The Origins, Persistence and Failings of HIV/AIDS Theory); married women are a high-risk group (TO AVOID HIV INFECTION, DON’T GET MARRIED, 18 November); more exposure results in less infection (MORE HIV, LESS INFECTION…, 21 November); “infection” rates from this incurable illness have declined dramatically without the inevitably required increase in deaths (NOTEWORTHY SUCCESSES AGAINST AIDS IN AFRICA, 4 December 2007); and more. By contrast, an alternative theory—I’ll call it the “stress theory”—successfully predicts demographic characteristics of “HIV infection” and has remained able to explain new results as they come in. The stress theory holds that testing HIV-positive is analogous to running a fever. The Perth Group has written copiously about the evidence that positive HIV-tests signify oxidative stress. My book shows that the epidemiology of “HIV” supports the similar, possibly identical view that testing HIV-positive is a rather non-specific physiological response to some sort of challenge or stress. This evidence-based stress theory predicts that whenever HIV tests are carried out on some group of people matched for other variables, the rate of testing positive will increase from the teen years into middle age before declining again at higher ages. Below the teens, the rate of testing positive will increase with decreasing age, reaching a high among newborns. Males will always test positive more often than females, except in the lower teen years when the reverse is often observed. This theory has sufficed to explain every significant new result since the book was published. Take the variation with age. That females test positive more often than males in the early teen years seems difficult to explain if testing positive means infection by a venereal disease whose chief carriers are gay and bisexual men: one would expect teenaged boys to be at greater risk than girls. On the other hand, this phenomenon fits the notion of physiological stress, since menarche (the onset of menstruation) is more physiologically stressful than what boys experience at puberty. At any rate, that female teens test positive more often than male teens was noted already in the mid-1980s among applicants for military service, in the Job Corps, and in a two-decade survey of military cohorts, all in the United States. I was recently led to look at data from various African countries in quite another connection, and—lo and behold—came across the statement that in Zambia, “The HIV prevalence among girls 14-19 years old is six times that of boys in the same age group” (Summary Country Profile for HIV/AIDS Treatment Scale-Up, World Health Organization, 2005). For both males and females, the numbers vary with age as predicted by the stress theory, reaching a peak in middle age. The numbers for males are significantly higher than for females—except for that teenage phenomenon of females affected more than males: among the only groups where there were significant numbers of deaths among young teens—African Americans and Hispanics—the numbers for females are greater than those for males in the years 10-14 and 15-19. Further: I mentioned in the book (especially p. 246 ff.) that black women seem particularly prone to test HIV-positive. The black-to-white ratio for “HIV” deaths among women, 24, is more than 3 times that for men, 7.4. The very fact that these numbers reflect deaths is in itself consonant with the stress theory. Hospital patients and trauma victims test positive at relatively high rates, higher the more critically ill they are (pp. 84-5 in The Origins, Persistence and Failings of HIV/AIDS Theory) . Therefore, among people who die from any one of a number of possible causes, one expects a certain proportion to test HIV-positive. The Centers for Disease Control and Prevention ascribes deaths to “HIV disease” whenever the person was HIV-positive, no matter what the real cause of death was, the manifest cause: cervical cancer, tuberculosis, unexplained weight loss, or just about anything else. So one would expect deaths from “HIV disease” to show the same demographic characteristics as “HIV infection” among living people, and the mortality statistics bear that out. It would be interesting to hear from defenders of HIV/AIDS theory their explanation for the age and racial distribution of these deaths on the basis of a supposedly sexually transmitted disease which, untreated, is supposed to bring death within a dozen or so years after infection: How is it that black and Hispanic females manage to survive to age 45-54 before succumbing to this disease whereas Asians, Native Americans, and whites don’t get beyond 44? How is it that black and Hispanic males manage to survive to age 55-64 before succumbing to this disease whereas Asians, Native Americans, and whites don’t get beyond 54? This entry was posted on 2008/01/07 at 8:01 pm	and is filed under HIV absurdities, HIV and race, HIV does not cause AIDS, HIV in children, HIV varies with age, HIV/AIDS numbers, M/F ratios. Tagged: female teens more HIV-positive than male teens, HIV deaths, HIV disease, racial disparities in HIV, racial disparities in HIV/AIDS deaths. You can follow any responses to this entry through the RSS 2.0 feed. You can leave a response, or trackback from your own site. I’m a 55 year old Black male. I tested positive for HIV last April. As I look back, at the time I was dealing with a tremendous amount of stress in my life (relating to the “stress theory”) I developed Shingles (didn’t know that was what the “bump” indicated). On examination, the attending physician told me I presented symptoms of HIV and urged me to get tested. I resisted at first given my own convictions that this HIV theory has way too many holes in it (I still feel that way). I eventually gave in. I relented while in my hospital bed simply out of mental exhaustion, including almost 24 hours in the emergency room waiting for an available bed. My test results came back positive the following day. I was eventually put on several meds: Truvada, Kalitra mainly. Thank God my body adapted fairly easily to these drugs, so the side effects initially were minimal. I don’t have a history of smoking or drinking which I’m told are contributing factors that allows me not to have severe toxic reactions to these drugs (poisons). It’s been now almost a year I’ve been on these meds. My T-cells increased from 19 to 210 in that period. Part of me is still very skeptical about the whole thing. Yet, I don’t know off hand of an alternate treatment so I can get away from intoxicating my body, enriching the coffers of pharmaceutical greed. I would greatly appreciate your feedback and council on this matter. I’m ready and prepared to shift this paradigm I feel entraped by. Thank you so much for putting the truth out there and given us a transparent view. I wish I could help, but you need a practicing physician to find out what really caused your ailment(s). Among doctors who don’t automatically place people on antiretrovirals, I know of only Drs. Sacher and Koehlein in Germany.